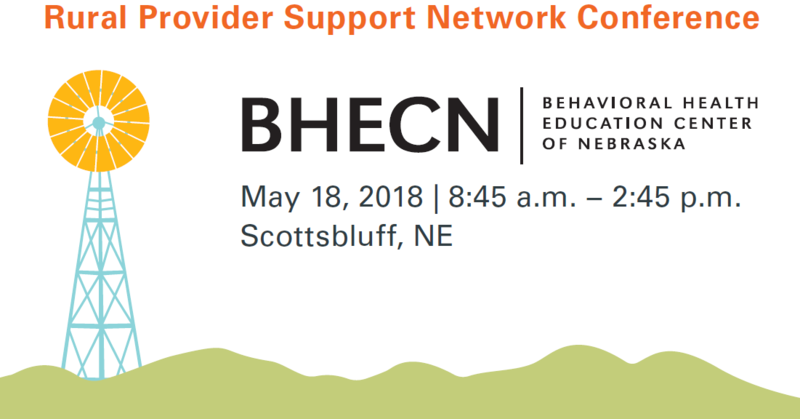 The first annual Rural Provider Support Network Conference hosted by the Behavioral Health Education Center of Nebraska was held on May 18, 2018, at the Harms Center in Scottsbluff, NE. To read about the conference click here. The majority of the state of Nebraska is considered a shortage area for behavioral health providers of all types. Particularly hit by this are our rural areas. Research indicates that this problem is furthered by difficulties with recruitment and retention of providers in our most isolated areas. The Rural Provider Support Network Conference is intended to develop support systems for providers in rural practice, in order to increase our ability to retain providers in these most needed areas. To find out about upcoming conferences and seminars sign up for the BHECN newsletter or follow us on Facebook or Twitter. The latest conference info and news.